I love their glossy covers and smooth pages. I love the loud thwack sound they make as their hefty presence drops to the floor on delivery day. This love of magazines may be genetic. My maternal grandmother, (parent of seven unruly kids) apparently would close herself in the bathroom when her magazines would arrive. I can picture her, up to her neck in bubbles, slowly turing the pages of a new magazine. Ahhh . . . . But I’m trying to be green. I’m trying my very darndest to minimize unnecessary stuff and exercise hyper- vigilant frugality. So I’ve stopped renewing all my magazine subscriptions. First to go was Martha Stewart Living. No real sacrifice here, as I didn’t feel the magazine was all that relevant to my current life. Then I had to say goodbye to Oregon Home. This one was harder, as I really like seeing all the great remodels and decorating. Plus the art director is a friend. The last to go will be Mary Engelbreit Home Companion. I received two gift subscriptions awhile back, so I called up and they simply extended my subscription. But I know this subscription will sadly end soon. So what’s The Non-Consumer Advocate to do? My library system operates a bookstore in a gorgeous old Carnegie library that sells not just used library books, but used magazines as well. My boys and I were shopping there today with their Summer Reading Program five dollar book vouchers. I cruised by the magazine section and picked up a semi-recent This Old House magazine as a gift for my husband. So not only am I saving the library from tossing this magazine into the recycling, but I’m doing something nice for my husband, and striking quite the bargain in the deal. The triple whammy. I do still get the one magazine, which is currently sitting on the coffee table. I might read it stretched out on the couch, or I may run the bath and take a good long soak and really steam up those pages. I may not have seven kids, but I do deserve a relaxing break every now and then. Don’t have the luxury of a library used magazine shop in your area? Institute a magazine swap in your workplace. Ask a neighbor if they’d like to share a subscription. Swap a few with a friend or neighbor. Find the magazine section in your local thrift shop. Whatever you choose to do, remember to recycle those magazine when you’re through with them. Or better, yet pass them along to someone else. Does your library have magazines in circulation? Mine doesn’t sell the old ones, but they have TONS of magazines that you can check out. They carry all the ones I’d want to subscribe to…like Cook’s Illustrated, Creating Keepsakes, Popular Photography, and hundreds more. I love, love, love this part of the library. When I am finished with a magazine I make sure any mailing labels are removed and then I drop them off at the laundry mat that’s a couple of blocks from here. I spent years having to do my laundry at the laundry mat and know how happy I was when someone left something to read. 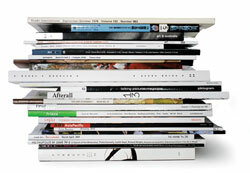 I am a magazine addict. So is my husband. There is a lady who comes to my house on her way to the hospital where she volunteers and picks up our ‘used’ magazines. I send her an email and she drops by and picks up a stack of magazines. I get a lot of paper craft magazines too. I send those to my crafty online friends when I am done with them. I read some of the mags I like at the library, although they don’t carry all the ones I like. We all get mags at Christmas. As another idea for recycling – preschools, primary schools, even elementary schools can use them. I was amazed last year during Grade 2 how many projects we turned to the magazine pile for pictures. Although, that reminds me of the shelves of National Geographics my parents had in the basement – my brother and I used those for years for pictures and maps, etc for school projects!